There are beard oils galore on the market and they come in every conceivable scent, I have tested a lot of oils but this one is different. Lee’s Premium Beard Care ‘Shave and a Haircut’ Beard oil is a Cologne scented beard oil. A Shave and a Haircut: This clean smell will remind you of an old-time barber shop. This cologne type scent will keep the ladies turning their heads. Shave and a haircut… Two bits. This is what Lee’s Premium say about this beard oil. One thing I miss about shaving is slapping on some After shave, ‘Shave and a Haircut’ Beard oil from Lee’s Premium Beard Care gives you that scent but on a beard and we all love our beards over a clean shaven face. I am convinced that Lee’s Premium Beard oils have out of all the oils, made my beard feel the softest. This is because they have made sure that their Beard Oils have the best possible base, a blend of Almond, Coconut, Jojoba and Argan carrier oils. 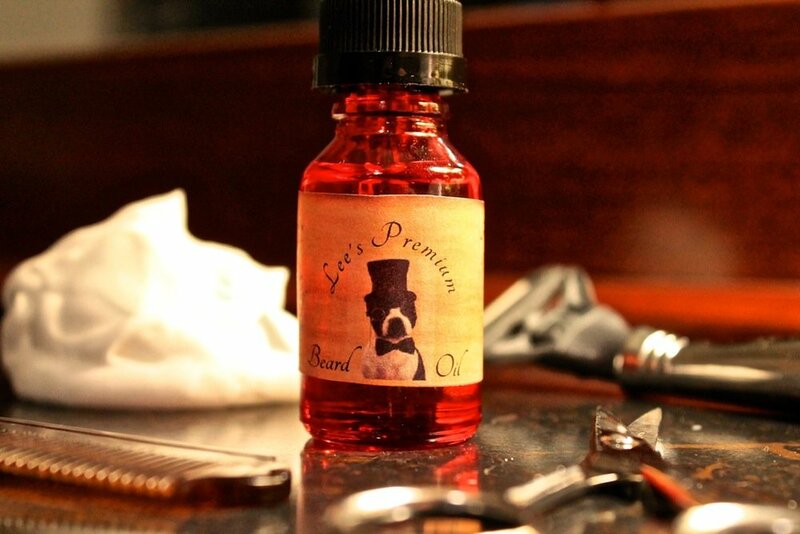 ‘Shave and a Haircut’ Beard oil from Lee’s Premium Beard Care is available from their website in 15ml $8.99 or 30ml $14.99 glass bottle with a glass dropper to dispense the oil. Lee’s Premium Beard Products is a family owned company that strives to make our customers happy. Our customers come first before anything. The dog on our logo is our very own pup named Stewie! We started our business in early 2015, but have been making beard products for our personal use for much longer. Lee’s Premium Beard Products offer several different kinds of products that will soften and keep your beard healthy. The oil found inside our products are all natural and help keep the roots of your hair strong as well as groomed. This oil will keep your beard tamed and smelling nice and fresh. Lee’s products help keep wiry hairs and dreaded beard acne at bay. Beard dandruff? Not anymore! The ingredients of our beard products are made of premium oils. Here they are: Argon oil, Jojoba oil, Almond oil and Coconut oil. Our beard oil and beard balm both contain these premium oils. For our scents we use premium essential oils or fragrances to keep you smelling fresh!